Philadelphia Eagles head coach Doug Pederson celebrates with team owner Jeffrey Lurie after defeating the New England Patriots in Super Bowl LII. 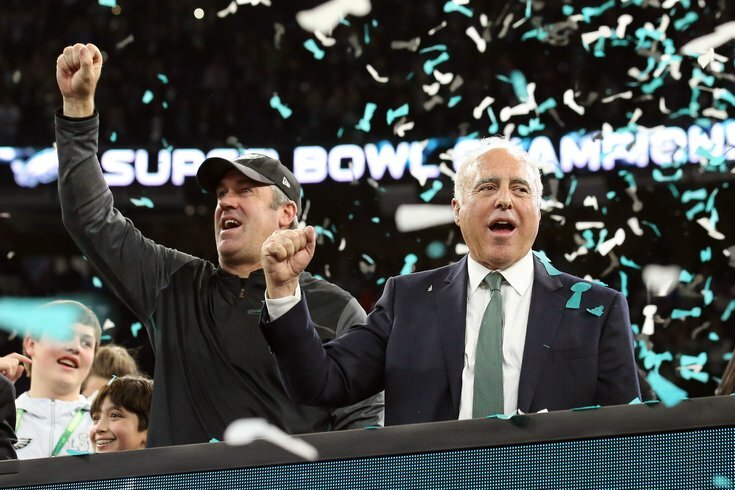 It may have taken over two decades, but on Sunday night Eagles owner Jeffrey Lurie's team did something no other team in franchise history had been able to do: win a Super Bowl. After beating the New England Patriots, 41-33, in a rematch of Super Bowl XXXIX – the only other time the Eagles reached the Super Bowl game under Lurie – the owner spoke to the media about what it means to bring the city its first football title since the 1960 Birds won the NFL Championship.